As the partial government shutdown stretches into another month, government programs intended to help some of the most vulnerable people in the country are facing widespread uncertainty and some say they are running out of money. Health services for Native Americans in urban areas, domestic violence shelter and programs that help people struggling with homelessness are all scraping by with whatever was left in their budgets during the shutdown or facing uncertainty about when more federal money will be available. "A safety net that has a frayed bottom to it makes people much less, feel more financially fragile and financially vulnerable than they already are,” J. Michael Collins, a professor at the University of Wisconsin- Madison, told ABC News. And for people who rely on the government’s safety net because they can’t work for whatever reason are seeing those services have to cut back or close the doors completely. Steve Berg, vice president for policy at the National Alliance to End Homelessness, said many programs are still using their federal money from the 2017 fiscal year. Many groups get much of their budget through competitive federal money every year but the awards for 2018 still have not been announced, even though Congress appropriated more money for homelessness programs last year, he said. "There are already a few programs who have run out of fiscal 2017 money and don't have any money to operate until HUD issues any grants but the number of programs will grow every day that goes by," Berg told ABC News. The Fort Peck Indian Reservation in the northeast corner of Montana is pictured on Dec. 14, 2017. HUD says 553,742 people experienced homelessness in 2017 and the vast majority lived in some kind of shelter or transitional housing. Hundreds of thousands of people have transitioned into permanent housing through HUD programs since 2017 and the agency said federal programs have helped reduce chronic homeless nearly 28 percent over the last decade in its last report to Congress. He said he worries that more programs will have to stop operating completely if the shutdown continues and that it could make landlords less willing to work with them in the future. “People who are relying on those payments to have a place to live, a lot of these, and at the same time a lot of the HUD housing programs rely on private landlords who are willing to rent to people who might not be every landlord's idea of a perfect tenant but ... to just leave them high and dry is not a very good way to treat your partners,” he said. One of the HUD programs affected by the shutdown specifically works to help homeless veterans in partnership with the Department of Veterans Affairs. Even though the VA side of the program is completely funded, Berg said the program only has enough money to pay participants’ rent in February. Other advocacy groups like the National Low Income Housing Coalition have also raised concerns that housing assistance contracts could expire if the shutdown continues through February. Berg said he wants the government to recall furloughed HUD employees and release to states, cities and non-profits some of the money that traditionally goes to homeless assistance programs so that the needy can still get help. "If the government can call in thousands of IRS employees to get people their tax refunds they can call in a few HUD employees to get people off the street,” he said. Some offices that fund programs to assist survivors of domestic violence or other crimes are still operating or have sent federal money to the states to be distributed. But Rachel Graber, domestic policy director for the National Coalition Against Domestic Violence, said they are hearing from programs that are very concerned and starting to lay off staff and tighten budgets in case federal funds stop coming. "As a general matter it has repercussions for the staff and victims and survivors to utilize these services because there's so much uncertainty for what's going to happen in the future and that's really scary for everybody," she told ABC News. At least one domestic violence shelter in Tennessee has said publicly they had to lay off staff in order to keep basic services like the hotline and emergency shelter going during the shutdown. Multiple shelters in Florida have also reportedly had to lay off staff. Graber said because survivors are leaving an unstable situation its important for these programs, or other government services they rely on, to be stable to help them get back on their feet. "Victims and survivors that are living in these situations particularly with economic abuse or the abuser was the sole breadwinner they really rely on these programs to establish themselves and get their heads above water while they are building new lives," she said. Earlier this week programs that distribute food and provide health care for Native Americans around the country said they were having to cut back on services because the already underfunded programs weren't receiving money during the shutdown. "The lives of native people should not be put at risk due to disagreements over unrelated budget proposals," Kerry Hawk Lessard is the executive director of Native American Lifelines, a health care provider in Baltimore that falls under the Indian Health Service, told members of the House Natural Resources Committee on Tuesday. 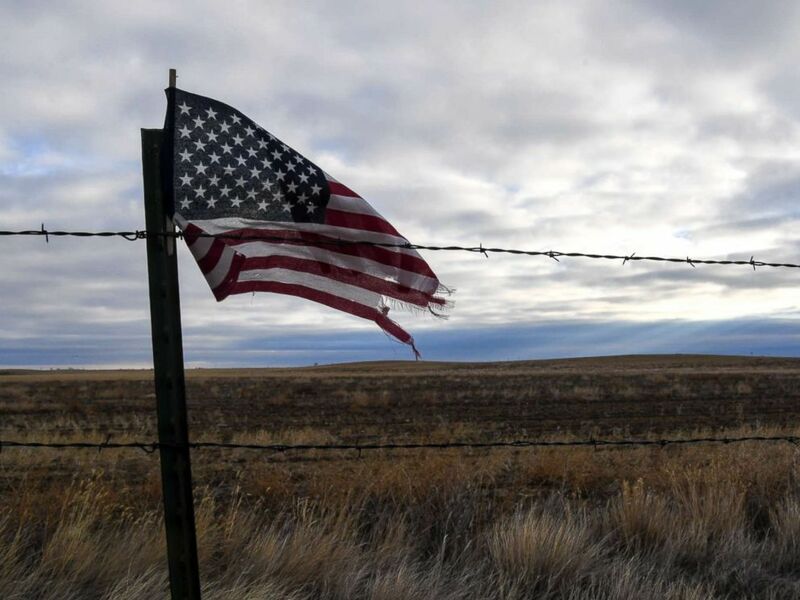 USDA says it was able to provide more administrative money to Tribes and states to ensure that food distribution programs to Indian Reservations can operate through the end of February and food deliveries are expected to continue through March. 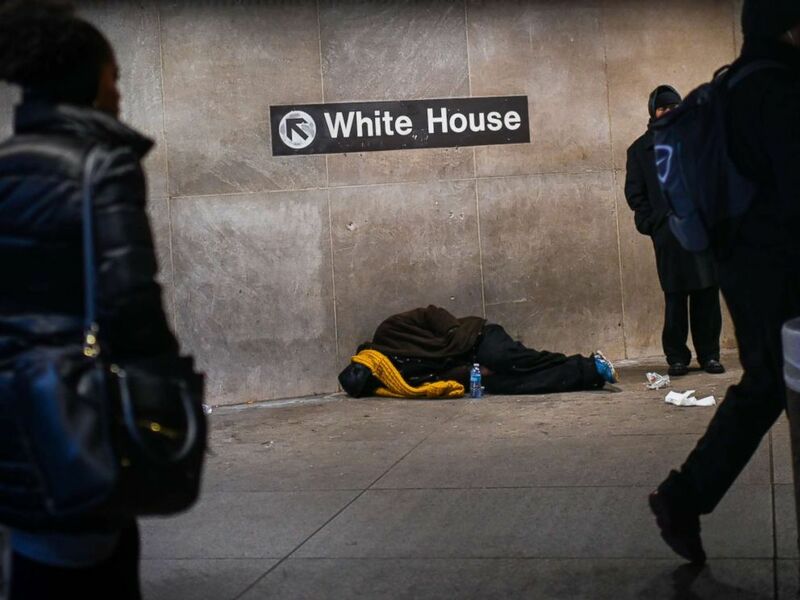 A homeless person sleeps below a sign indicating the exit to the White House at McPherson Square Metro station in Washington, Dec. 12, 2018. People who use food stamps should get their normal amount of benefits early on January 20, but they will have to last until the end of February. The USDA has not announced how it will handle food stamps, also known as the Supplemental Nutrition Assistance Program. The agency says other nutrition programs have enough money to keep operating for a limited time. USDA says the Women, Infants, and Children program can operate until the end of February and child nutrition programs, like reimbursing schools for the cost of providing breakfast and lunch, are fully funded through the end of March. "At the direction of President Trump, USDA has been working with the Administration to find solutions, within the limits of the law, to ensure that low income families have access to our nutrition assistance programs for as long as possible," A USDA spokesperson said in a statement to ABC News. "We understand that the current lapse in appropriations creates uncertainty for the future, but we remain hopeful that Congress will soon pass appropriations legislation that the President can sign, so that we can return to normal operations, and continue our efforts to 'Do Right and Feed Everyone.'" But people who live below the poverty line or rely on federally funded programs for food or housing aren’t the only ones who could be made more vulnerable during the shutdown. Collins researches consumer finances, specifically focusing on low-income families. He said a shutdown like this hurt more than just the hundreds of thousands of federal workers who aren’t being paid, but also economically vulnerable people who live paycheck to paycheck. Surveys by The PEW Charitable Trusts show that about 40 percent of families in America don’t have enough savings to cover an emergency expense like unexpected medical bills or paying rent if they’re temporarily without income. 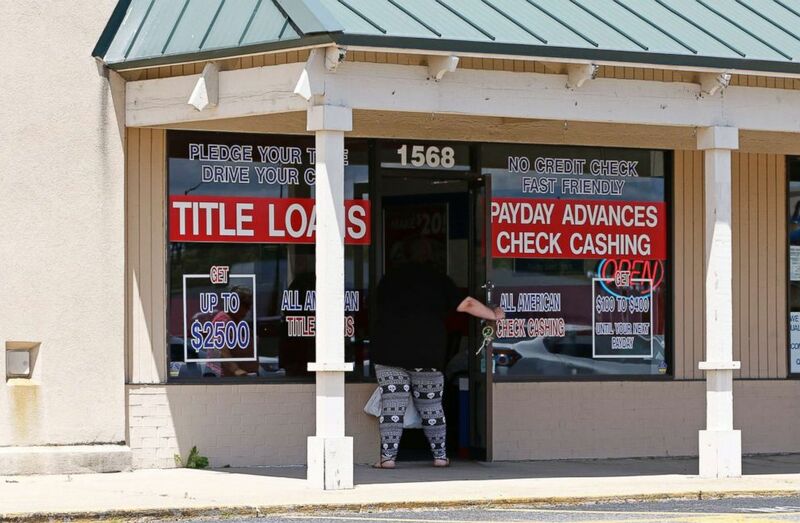 Collins said most of those people will have to borrow money or rely on friends and family to make ends meet and that even if they get back pay it may not recover the cost of late payments, decreased credit scores, or interest from temporary options like payday loans. A woman enters a payday loan business in Brandon, Miss., May 12, 2017. Collins said the country has a system to provide services to those people if they’re without work during a recession, but not during an "episodic" period like a shutdown where workers aren’t being paid, contractors are without work, or small businesses see a sudden drop in customers. "When bad things happen to otherwise families that are trying to live by the rules. There isn't a whole lot there for them at this point. We have food assistance, we have a little bit of health assistance. You know we have a few things here and there," Collins said. "And you pull that rug out from under them and there's nothing but you know charity care and friends and family. And I just don't know that that's a sufficient system to be able to support the millions of low-income families many of, you know let's remember too, most of these income families have kids, so it's you know disproportionately kids who are affected here."